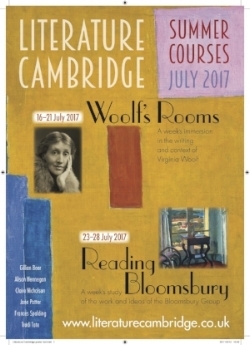 In July 2017, I attended the Cambridge Literature Summer Course Woolf’s Rooms, together with more than 25 students from all around the world. An unforgettable experience! I was immersed for a whole week in the writings of Virginia Woolf and gained a deeper understanding of her work. We studied the different meanings of rooms in Woolf’s essay A Room of One’s Own and her novels Jacob’s Room, The Waves, To the Lighthouse and Between the Acts. We learned about public and private space, boundaries, rooms filled with people, empty rooms, rooms inhabited, rooms creating safety, a sense of self, and so much more. I did not know that Virginia Woolf referred so often to rooms in her novels. And I found it amazing to discover how she connects so many themes to rooms. For me this Summer Course was very inspiring for several reasons. I gained many new insights from the morning lectures, all given by leading experts who showed great passion for Virginia Woolf and who stimulated me to read and reread her works. The lectures helped me to slowly recognise Woolf’s unique voice and tone and to start understanding the multiple layers in her work. As one lecturer concluded: ‘Woolf’s novels keep giving!’ They are so dense and rich. I also enjoyed the group of participants. It was a mixed group, people of different ages, cultures and backgrounds, but with a common interest in Virginia Woolf, the Bloomsbury group, modernism and women’s writing. Easy to keep conversations going! I liked the discussions in small groups of three or four students and a supervisor (tutor). Reflecting on the lectures and sharing our own reading experiences, we got a flavour of the famous Cambridge supervision model. The guided tours to King’s College, Girton College and Newnham College were all very worthwhile. An absolute highlight for me was our visit to the Fitzwilliam Museum, where we had a close look at the manuscript of A Room of One’s Own. Impressive. A goosebump moment! Another highlight was when we read aloud long sections of The Waves, a very intense experience. And I also keep good memories of Kabe Wilson’s talk on his remix of A Room of One’s Own: Of One Woman or So. A very original talk which astonished the audience. Last but not least, there were the fun moments, the daily life in Homerton College, the drinks in the bar, the walks through Cambridge, the conviviality, the discussions on how to become a real ‘Woolfian’ and our future plans. I made many new friends in this Summer Course. I already look forward to seeing them next year.